One of my absolute favorite things about the holidays is spending time with friends and family. I love visiting one another’s homes, taking in all the twinkling lights and admiring everyone’s festive decor. It just gives me a warm, connected feeling that makes the season special. As my calendar fills with all the parties and gatherings that this time of year brings, I’ve created my own clever holiday life hack. I keep a small chest where I collect little treasures that catch my eye and that I know would make perfect hostess gifts. This way, I always have something on hand and I don’t have to worry about running to the store at the last minute. If you’re looking to do a little stocking up on your own before the hustle and the bustle of the season gets underway, here are a few of my favorite finds and some tips for putting together the perfect hostess gifts. Showing gratitude by giving a small gift to the hostess of any holiday gathering is always a welcome gesture. A bottle of wine or some flowers are certainly tried and true hostess gifts, but I really enjoy doing something a little bit different. One thing that makes finding hostess gifts fun for me is to pull together items with a theme. When it comes to grouping items, there are a number of different themes that can be helpful in creating that perfect ensemble of gifts that will be truly memorable. At any given time, there are always a few whimsical trends that dominate from season to season. Right now, pineapples are pretty much everywhere and there are so many cute ways to carry through on this theme. 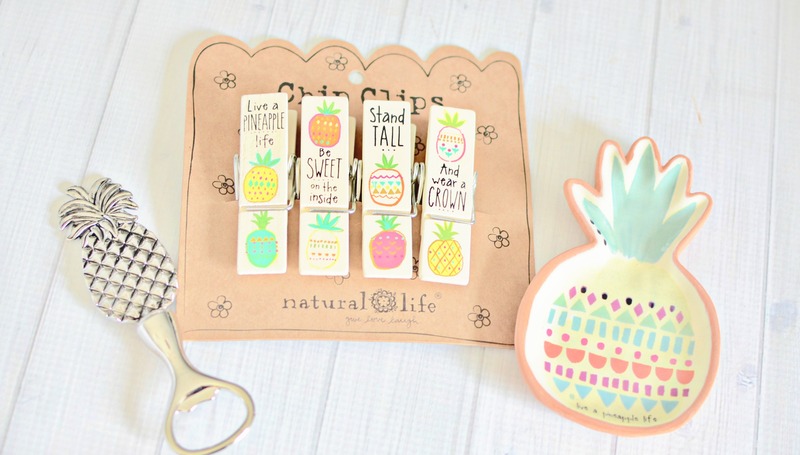 We spotted this colorful painted Pineapple ceramic tray that makes a superb spoon rest and the coordinating clips that would work for keeping chip bags and other perishable food items closed. The set was completed with this silver pineapple bottle opener from Boston International. If you know the hostess well and the colors of her kitchen, creating a color matched hostess gift is another fun theme. This is a standby of mine and I usually just keep an assortment of cute kitchen towels with coordinating solid colored kitchen utensils in my gift chest. You can wrap the towel around the utensils, tie them all up with a pretty bow and voila, super easy and very affordable hostess gift. A Red and aqua color scheme is one of my favorites, but other good ones include yellow and orange, green and pink or even black and silver. 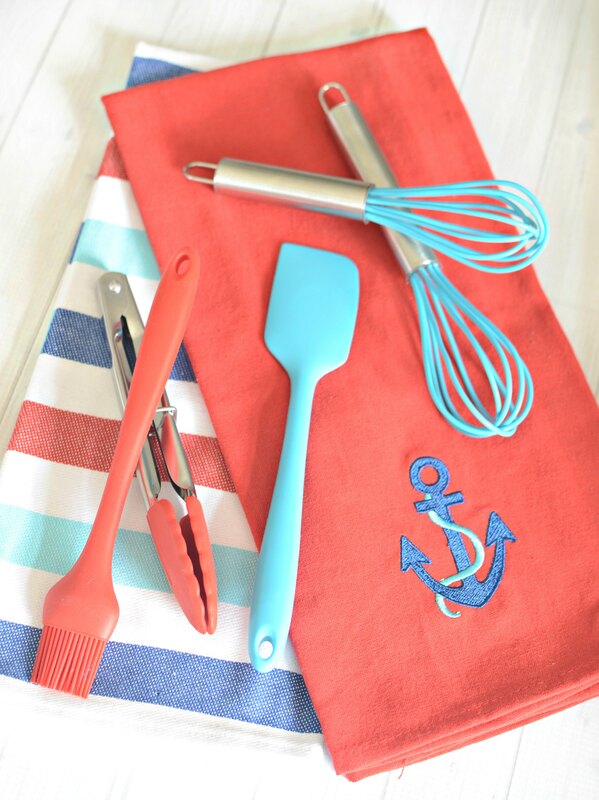 I found the cutest little mini-utensils, so in this case we chose an assortment of those and put them together with this nautical blue and aqua nautical kitchen towel set. Okay, let’s be clear, designer doesn’t mean expensive. But almost everyone we know has a brand that they love. Some people adore Tervis Tumblers or others are fans of the Life is Good t-shirts. Discovering a smaller item or set of items by the hostesses favorite brand can make a very thoughtful gift that shows you’ve notices her particular tastes. Sometimes as the gift giver it can also be fun to introduce the hostess to a brand you love. We all know that fitting in time for self-care is hard enough under normal circumstances, but during the holidays when we often need it the most, it’s pretty much impossible. That’s why giving hostess gifts that encourage some personal pampering can never go wrong. They’re an invitation to slow down and relax during this busy time of year or something to look forward to once everything calms down again. 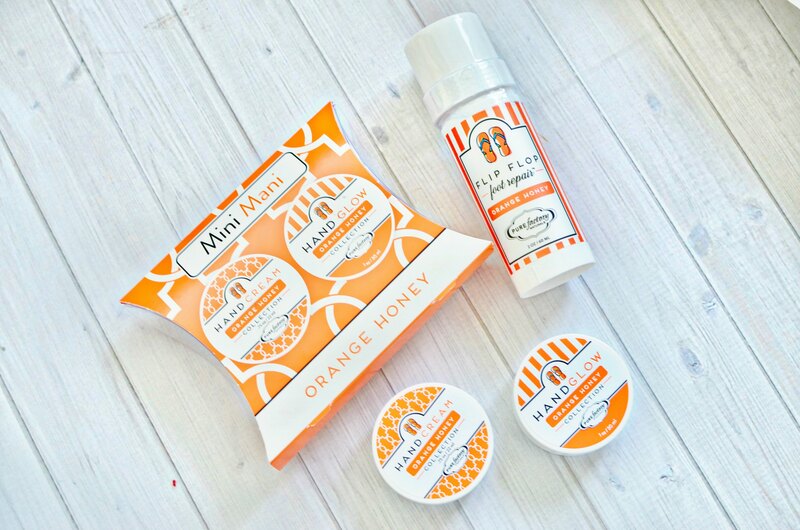 The scent of this sweet orange and honey mini-manicure set is without a doubt Florida inspired. You can almost feel the warm glow of the sun on your face when you twist open the top of the hand cream and hand glow. Oh, and don’t forget to give those tired tootsies a little attention with this flip flop foot repair. In Florida it’s flip flop weather year round, even at Christmas. It doesn’t matter where you live, everyone loves receiving a touch of the sunshine state. Gifts that bring a little of the outside in seem to always brighten anyone’s day. In recent years, stemless plastic wine glasses have become a favorite. I think they are gaining in popularity because they can’t break and you don’t have to hand wash them, just stick them in the dishwasher and you’re good to go. But they still look classy for any special occasion. Pair them with some coordinating cocktail napkins and you’ve got a gorgeous hostess gift that is elegant and useful. 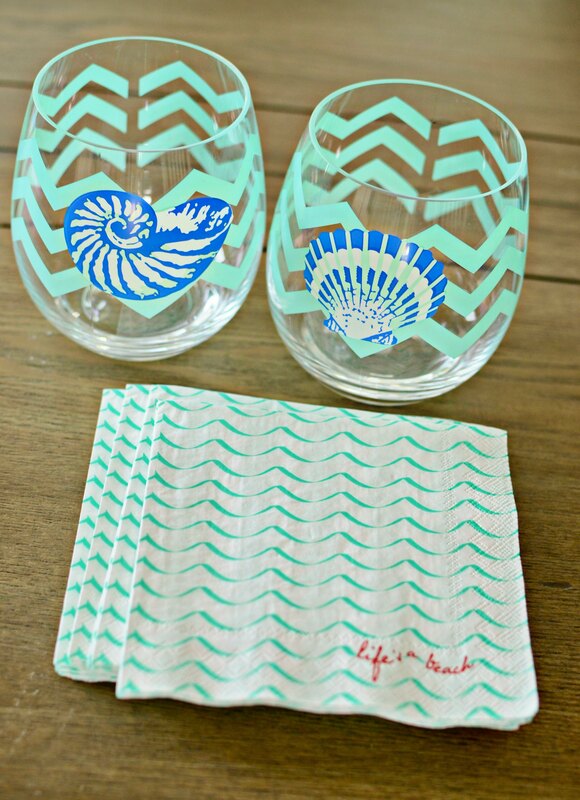 This chevron shells stemless wine goblet set has that coastal Florida vibe that will conjure up visions of sugar sand beaches and golden sunsets while one enjoys sipping chardonnay from the comfort of their own home. The matching chevron napkins add that little extra touch to tie the whole hostess gift together. Sometimes it can be fun to break out of the box a little and put together an assortment of items that don’t necessarily connect with a well defined theme, but they sort of create their own unique theme. I often find quirky and unusual trinkets and treasures that just make me smile and I know they will do the same for whoever receives them. 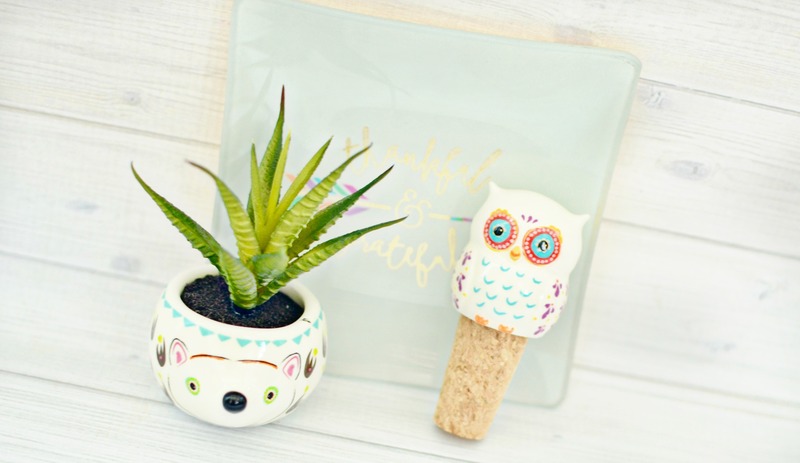 The adorable hedgehog succulent was the start of this menagerie. 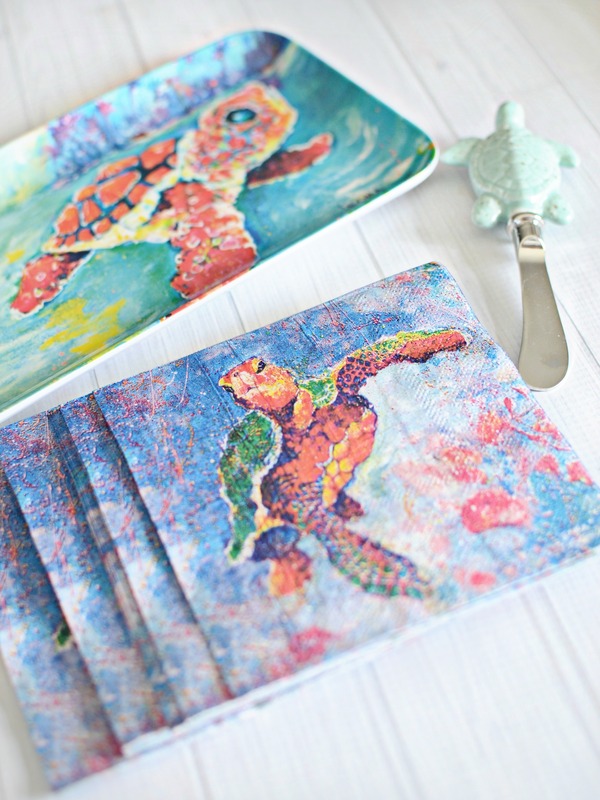 He charmed me from the moment I saw him and I knew he would make an ideal hostess gift. As I continued to peruse the Natural Life display at my Bealls I happened upon the owl wine stopper and the thankful and grateful glass tray and it just seemed like they were meant for each other. This may have been my very favorite of all the hostess gifts I now have safely stored in my gift chest waiting for the first celebration of the season. Want to start your own gift chest for stashing hostess gifts? Grab some of the great gifts I’ve featured here this holiday season or see what other inspiration you can find at your favorite stores. Do you have any other fun themes you love to use for hostess gifts?